POLAROOF RAC-OZ is a solar reflective, urethane, waterproof coating that harnesses the unequaled performance characteristics of superior oxazolidone (OZ) technology. This exceptional coating is intended for areas where a combination of high strength, chemical and oil resistance, and a totally waterproof surface are required. The key component in POLAROOF RAC-OZ is approved by Underwriters Laboratories® and Factory Mutual Research Corporation®. Provides protection against pollutants, oil, grease and lubricants. Fire retardant coating protects roof against grease fires. Significantly improves resistance to impact, puncture and roof traffic abuse. Prevents adhesion of grease deposits to allow for easier cleaning. Produces a fully adhered, seamless, high density, water- proofing membrane. Protects substrate against rust, corrosion, chemical and fungal attack, UV radiation, and bird peck damage. Easy to apply by brush, roller, or airless spray. Can be used over asphalt and coat tar BUR’s, APP and SBS modified bitumen, all types of single ply including EPDM, TPO and PVC. Also used to protect concrete, mineral composites, steel, galvinized and factory finished metals. RAC-OZ is additionally used to spot repair areas subject to localized exposure from corrosive chemicals. Surfaces must be dry, free of dirt, loose debris, oils, grease or any substance that could interfere with adhesion. Surface must remain at least 5°F above dew point during the application and curing process. Polaroof RAC and OZ Catalyst are combined to become Polaroof RAC-OZ, this is achieved by mixing a one quart unit of OZ Catalyst into a five gallon pail of Polaroof RAC. Mixing will require the use of a power stirrer and should proceed for at least 3 minutes to achieve complete dispersion. Reinforcing over seams is achieved by embedding ROOFAB into a fresh coat of POLAROOF RAC-OZ applied at 15 to 25 mils wet thickness. The fabric is then brushed thoroughly to squeeze the POLAROOF RAC-OZ upwards to remove all voids, fishmouths and dry spots. A second coat is then applied to seal the surface of the fabric. Bolt-heads and complex penetrations should be sealed with sufficient POLAROOF RAC-OZ modified with K CATALYST. As soon as the modified POLAROOF RAC-OZ has dried, it may be coated with additional POLAROOF RAC-OZ. Application over all types of single-ply roofs requires the preparation detailed above, including reinforcement of seams. Some types of rubber will swell slightly immediately upon application. This is normal, the adhesion process is complete when the original dimensions have returned. New urethane foam should receive 2 coats of POLAROOF RAC-OZ at 15 mils wet thickness per coat. Sudden precipitation will not wash POLAROOF RAC-OZ off when wet or newly applied, but will produce a mottled, dull appearance that is not detrimental to overall appearance. 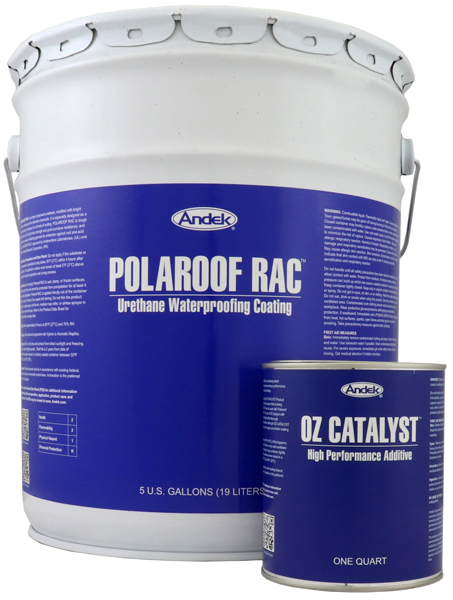 POLAROOF RAC-OZ should never be applied to a wet or damp surface, or pinholes may result. Use Xylene or Aromatic Naptha. Shelf life is 24 months in unopened cans. Part-full cans should be avoided. Storage must be out of direct sunlight at below 90°F to avoid skinning. Once mixed, POLAROOF RAC-OZ must be used within 12 hours.